Head over to London's Excel to play with the new digital Etch-A-Sketch from Asus this Halloween, as the Asus Eee Top gets its first public airing. 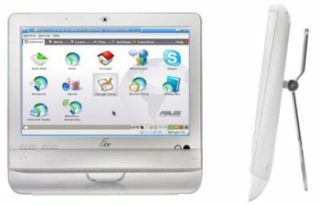 Reports from Asia also claim that Asus plans to launch notebooks featuring similar touchscreen technology early in 2009, in addition to the Eee Tops – which the manufacturer hopes will be a hit in schools. Digtimes also claims that Asus' touch panel notebooks will run Windows 7. We should have further information on the Eee top directly from Asus very soon. Head over to Stuff Live on All Hallows' Eve later this very month to play around with Asus' new digital toy.